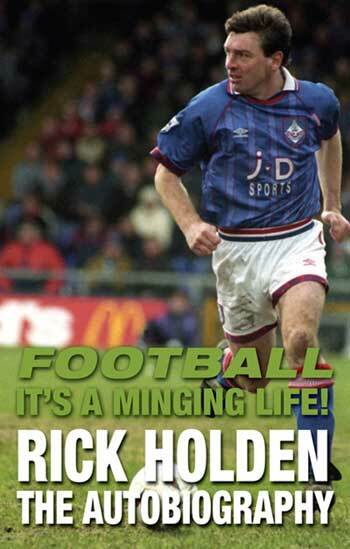 Rick's first book to be released was the highly anticipated autobiography "Football - Its a Minging Life: Rick Holden The Autobigraphy." The book is filled with hilarious stories of the antics that Rick got up to at his various clubs and explains in detail, sometimes too graphically, some of the tricks that he played on his teammates and how he tried to live his life around the distractions that football imposed. Rick is a survivor and never gives up, and his autobiography conveys the message to aspiring athletes that if you persevere you will succeed. This book is about his life and not just an episodic detail about football players and games. Rick talks honestly and controversially, and this book is a must read. The autobiography can now be ordered from Wibble Publishing. Rick's second book became available on 1st. March 2011. The book is about his second sporting love, cricket, and has been jointly written with Oldham Athletic historian and author Dave Moore. "Lancashire Cricket: Every Day of the Year" can be ordered online from Wibble Publishing. Book number three was "101 Things That Get Our Goat About Football" is an amusing look at the state of football, both in the UK and worldwide. Rick Holden, as an ex-Premiership player, has identified 101 things that really annoy him about the sport and Dave Moore, as a dedicated fan of the game, gives his perspective on the irritants that Rick has singled out. Sometimes the duo are in sync but other times they are opposed. Whether or not the duo are of the same mind or not, the comparisons make compelling reading and leave no stone unturned. Read more about it or place your order at Wibble Publishing. Next came the true story behind the 'Balladromic' rise of Barnsley FC which tells how Andy Ritchie and Rick Holden overcame all the odds to help the Tykes win their first outright trophy since 1912 in a thrilling penalty shoot out at the Millenium Stadium against highly fancied Swansea. This story gives all the behind-the-scenes details of just how hard the job was and gives an insight as to how they transformed the miraculous achievement. The link for "Barnsley FC: Into The Championship" can be found at Wibble Publishing. Number five was jointly penned with Dave Moore. "14 Great Games: Oldham Athletic" tells the inside tale of how little Oldham Athletic shook up the football world with an amazing period of success that made them the whole country’s favourite ‘second’ team. They took on the might of Leeds United, Arsenal, Southampton, Everton, West Ham, Aston Villa, Chelsea, Ipswich and Sheffield Wednesday... and they wiped the floor with them all in their quest to reach the holy grail of the First Division of English football. These matches along with with two FA Cup Semi-Finals against Manchester United, a League Cup Final against Nottingham Forest and other memorable matches are covered in this nostalgic look back at the incredible achievements accomplished by the club. The book is a an in-depth look at what it was like to actually be involved in the games, both from the players’ perspective and from the fans’ point of view. The link is at Wibble Publishing. Rick is currently working on another two joint ventures with Dave Moore. After their very successful "101 Things That Get Our Goat About Football" it is being followed up with "101 Things That Get Our Goat In General" and "Lancashire Cricket: Every Day of the Year" is to be followed with "Yorkshire Cricket: Every Day of the Year." Details of release dates will follow. here is a link which shows his magic at work.